The Waxahachie Lions Club helps bring Miracle League home. Naughty or nice, everyone welcome at the Waxahachie Family YMCA 5K Santa Run. Flowers benefit from the rain as much as they do the sunshine. The Waxahachie Lions Club is proud to announce its partnership with WISD to rebuild and rehab many of the dilapidated backstops on our campuses. $9,400 is a small price to pay for years of fun, teamwork, and life lessons taught on these fields. Thanks again to Dr. Glenn and WISD for all that you do. The high school construction has really come a long way. People say pictures are worth a thousand words. Well, experiences are worth ten times that. The opportunity to participate in sports, for many, is like looking at a picture. They can only dream of experiencing it. The Miracle League of Ellis County is trying to bring that picture to life with the construction of a baseball and playground facility made to include all. Hope you enjoyed the program! Lion Tom Bowsher from the Ferris Lions Club came to talk to us about the Lions Sight & Tissue Foundation. Representative Wray stopped by the Waxahachie Lions Club to provide a legislative update and a look into the happenings in District 10. Get to know your elected officials by coming to a noon meeting of the Waxahachie Lions Club. Check our calendar and upcoming speakers links often as we update them frequently. Lions & Baseballs & Backstops...Oh my! The Waxahachie Lions Club and Waxahachie ISD have partnered to repair existing backstops and build several new ones at several of the WISD campuses. Two new backstops have been constructed at Northside Elementary. In addition to those new backstops, the existing ones had all new fencing and fasteners installed returning them to like-new condition. This partnership will allow for the Lions Club to be able to step in with funds to assist with any future repairs. 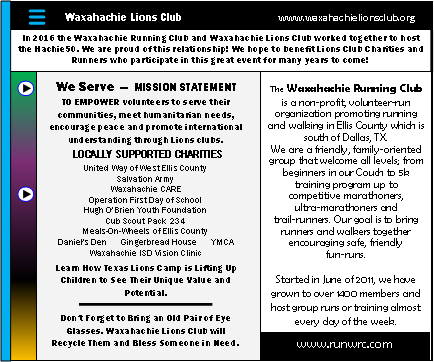 Stay tuned for future projects from your Waxahachie Lions Club. Lions Club & WRC to hold 3rd Annual Hachie 50! The Waxahachie Lions Club and the Waxahachie Running Club present the 3rd Annual Hachie 50! Come test your endurance on Saturday May 6, 2017. The race features a flat, fast, tree-lined road course with custom finisher medals. Individual races are $60 and the 50 mile relay is $150. Prices increase on December 31, 2016 so sign up today! 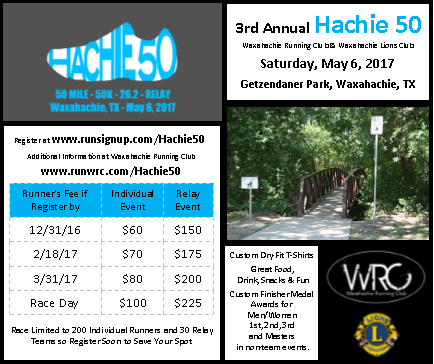 For more information visit http://www.runwrc.com/hachie50. Please make plans to attend our weekly club meeting in the coming weeks to get on the sign-up sheet!